Top Note: Fresh mint, green apple & Amalfi lemons. Heart Note: Tonka bean, geranium & Ambroxan. Base Note: Madacascar Vanilla beans, Vetiver, Virginia Cedar, Atlas Cedar & Oakmoss. 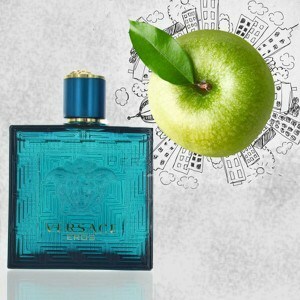 Versace EROS for Men – Eros interprets the sublime masculine through a luminous aura with an intense, vibrant, and glowing combination of fresh mint leaves, Italian lemon zest, and green apple. An addictive sensuality accented by oriental, intriguing, and enveloping notes like tonka beans, ambroxan amber, geranium flower, and vanilla melds with a racy virility symbolized by woods—such as cedarwood from Atlas and Virginia—while vetiver and oak moss provide intensity and power to the composition. The bottom line is simple. 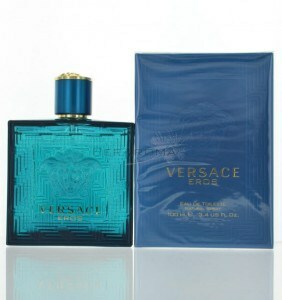 If you are looking for the biggest bang for you buck Versace Eros is the one to get, ladies love it and the price is quite nice for the quality of fragrance you’re getting. This cologne lasts a long time, smells amazing and it’s just an all-around men’s cologne that is a must have! This Style: Summed in 3 words!